Long-standing king of Italian paddling, Leo Nika, came home second in the men’s elite race while his brother Claudio was fourth. Dark horse and event co-founder Martino Rogai split the brothers to claim the third step of the podium. Susak Molinero was runner-up in the women’s and looks to be in good form again this year, while the under-rated Melanie Lafenetre from France (GlaGla Race champ) was third ahead of local lass Chiara Nordio. There’s also a massive photo gallery over on The Paddle League’s Facebook. The Florence Paddle Games has been finally an amazing event, I’m so happy and proud of it. Probably the most exciting race in Italy ever, we followed the scheduled giving the right focus to everybody. We started on Saturday morning with the Amateur long distance, 6 km (2 laps of the Racing track between Florentine bridges) and immediately this race has been emotional for me with my young brother Diego at his first SUP race taking the win in our city. After the Amateur we had the women Pro Uffizi Sup Race, 15 km (5 laps). The choice to let the Pro Women start alone has been so bold. We would like girls could have the same chance to be watched by such crowded place as the center of Florence does. The women race has been so fascinating, with Olivia and Susak taking the lead and working together until the final lap when Olivia made a gap that took her to the victory. But the main battle has been for the third place between Melanie Lafenetre and Chiara Nordio, they fought all the time until the breathless sprint (we posted the video on Facebook and Instagram) that made this race more exciting. We think the girls deserved to have the racing field on their own for two hours, their race has been so fun to watch and sometimes we lose this battle of ladies because of they happen at the same time of male races. The men Pro Uffizi Sup Race has started just after the last woman finish. More than 30 top paddlers of Italy were present. The top Italians were there with Leonard Nika, Paolo Marconi, Giordano Bruno Capparella, Davide Ionico, Claudio Nika and Martino Rogai (only Federico Esposito missed the event cause sickness). The world Champion Bruno Hasulyo was there. He has lived in Florence for 12 years, despite of his Hungarian passport, Bruno is a real Florentine boy. And we had some other international paddlers from Israel, Slovenia, Greece, Canada. The start has been so fast, the racing track was made with a lot of buoy turning that made this race a sort of Technical Race in the flat water. It’s like a F1 circuit in the town, with 5 laps to rule under a so crowded place. All the bridges and banks of the river were full of people watching this race getting fascinated of this sport. After the first lap the first train has been formed with Bruno, me, Leonard Nika and Claudio Nika fighting until the finish line for the first place. During the last lap Leonard me and Bruno started sprinting, at the end Bruno won the race with Leo second and I got third. Behind us, a lot of other battles took place as the amazing battle for 5th place and prize money between Paolo Marconi and Liran Machlev from Israel. This made the entire race so interesting to watch and the crowd had appreciated this format. On Sunday we had the Junior Uffizi Cup, with an interesting battle between the best young paddlers from Italy. But has been more like a party with all the kids so fascinated to could paddle close to the champions as Bruno, Paolo, Giordano, Susak, etc. And we also had the Florence Fun Race powered by Starboard, a really fun sprint race in the best scenery just in front of Ponte Vecchio. I’m so proud of this race, my main goal launching it was to show to the Italian and international SUP community how nice is paddling in Florence. 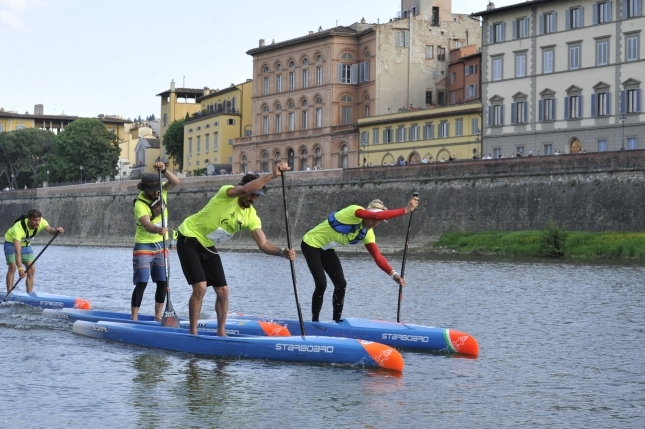 But also how much important is involve the public in this sport, and Florence as a lot of place in the world could become a sort of stadium of SUP, with a competition format close to the motorsports. And we are so proud about the girls race, they could race finally with all the attetion from the crowd and they deserved it, I hope to have more girls next year to make the female race even more fascinating. And of course the kids race and the Fun Race. Everything was cool in this race.